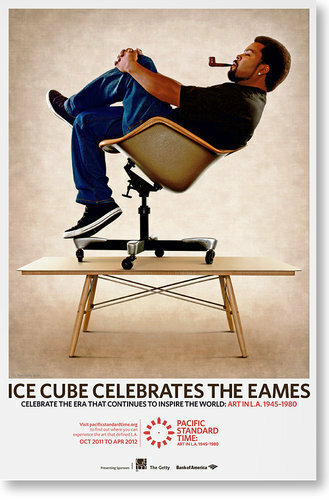 Ice Cube Celebrates The Eames for Pacific Standard Time the birth of the LA art scene. For more info on Ice Cube & The Eames visit http://pacificstandardtime.org. Ice Cube drives Inglewood blvd. describing the Los Angeles that he knows. He talks of landmarks like The Forum, Five Torches, Cockatoo Inn, Brolly Hut, and Watts Towers. He refers to the 110 as "Gangsta Highway". Cube says coming from South Central LA teaches you how to be resourceful. The video cuts to Cube walking the Eames House perimeter, through the Eames living room, and sitting in the Eames lounge chair. He brings us back to his NWA years when he studied architectural drafting before launching his rap career. One thing he learned that translates is to always have a plan. Cube describes the modern, green and resourceful building design of Charles and Ray Eames. Visionaries of connecting nature and structure. Cube ends by saying "Who are these people who got a problem with LA? Maybe they mad cuz they don't live here." Song during intro is "A Bird in the Hand" off of Death Certificate.